The Transactions Search report can help you to locate any unlinked payments or credits. Run this report immediately after posting fees to quickly identify and correct payments, or credits, that need to be linked to fees. If you use our ePayments feature and Process Credit Cards/Bank Accts after posting fees, run this report and correct unlinked fees & payments before creating your ePayments batch. A paid fee can incorrectly be pulled into the batch if it is not correctly linked to its payment, resulting in an overpayment on the family account. From the Special Search Drop Down, choose All Credits w/Unapplied Amt Remaining. This family has made a $150 payment. $100 of it has been applied to a fee and $50 is unapplied. Because their balance field shows a credit (-$50), we know there is no outstanding fee available to link to the $50 credit. Leave this overpayment/prepayment unapplied until a future fee is posted. This family made a $100 payment and none of it has been applied to a fee. Because the family has a $0 balance we know there must be a fee to link that payment to. All linking is done from the payment transaction. Click the Pencil next to the unapplied payment. 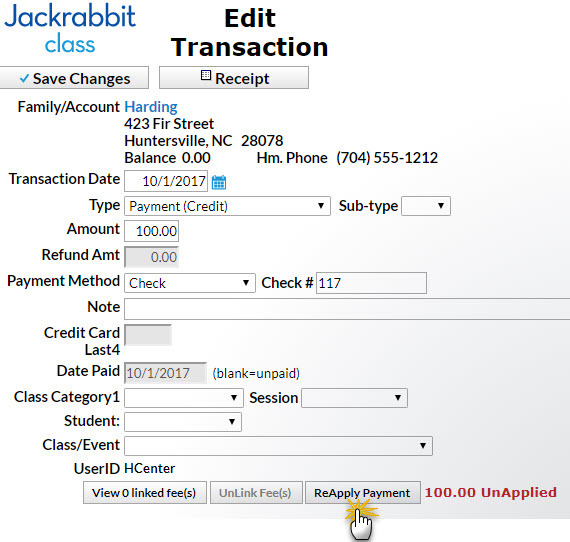 In the Re-Apply Payment Transaction screen, there is an outstanding Tuition Fee of $100. Click in the Tuition Fee's Apply Amt field.